I want to clear something up here before getting to any more revisions. As I know these works are sometimes tedious and often there is little changed but a word or two. I wanted to revisit that early post I almost wrote about editing (before I was seduced by old episodes of Futurama and Family Guy…). It should be clear by now the point of this whole madness, but I feel maybe it has been lost in all the commentary. I believe in the poem as process. This is a unique view as many of my peers are wholeheartedly relieved when a poem is ‘finished.’ From the write up of my first poetry class, back in 2009, I declared that only a poem that has been visited over and over by many stages of the poet can be concluded as finished… and that with those parameters, a poem may never be complete. Like assessing the work of a writer before their death, a greatness may yet be reached. It’s a hard philosophy to hold, especially when the urge to call a poem finished arises and I have but to take the plunge into permanence. The poem I will be addressing today is one of those well worn poems which I feel is nearing its end. I have been tweaking and tweaking and tweaking this poem… over and over and over… there is one revision needed. Do I call it a day and proclaim this poem a finished work? The answer is no. But I can let it rest. The poem as a work should not be bound by the author in a ‘what I meant’ kind of way, but is linked to the author in a knotted sort of tree ring way. Only I, the poet can make changes to my own work. Only I can say whether or not it is finished… with the advice of peers and editors and occasionally my relatives. So letting a poem rest is a better way to imagine a finished poem. Perhaps I will tire of the facetious title, or the structure of the stanzas, or the idea of repetition in the piece. Maybe I will scribble it out and toss it way. No matter what happens later, there was this version, as the one before, as the one following, A long lineage of versions in the process, a poem over and over and over, no more or less itself, but complete in its process. This is one of those poems I have editing. Short poems are hard to edit because there isn’t much there to change. 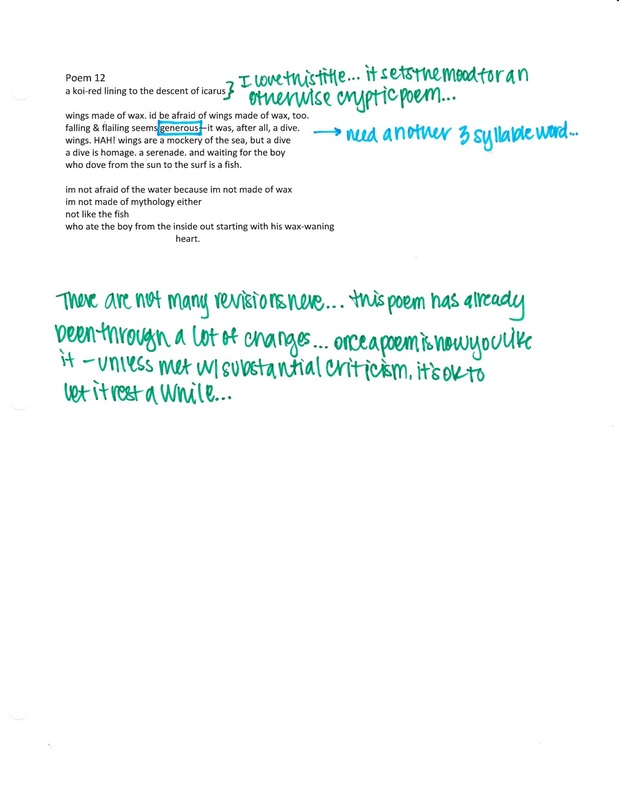 This makes shorter poems hard to crack open and easy to pass over when it comes to that hard editing. I will make the noted edit and another small one with the notion that at a later time I may be brave enough to crack open the piece and try again. Big takeaway today: treat poem as process. Imagine the drafts as a version of its life, photographs of its growth and maturity. Don’t worry if the work is iffy or complex now, those battles will weed themselves out at you, the poet and revisionary, work out your style. Think of every poem as an opportunity to tackle even a small hang-up while keeping in mind the main concepts of the piece. I promise no one is in danger of being Walt Whitman here and therefore should give their wook a good read through.